I'm in love with all things Votivo. But the new Dalian Collection really speaks to me. The faceted black glass jars, topped with a gleaming silver lid and arrow-shot signature V, are so beautiful it wouldn't even matter whether there was a delicious smelling candle inside. Luckily, there is -- like Red Currant, a delectable blend of red currant, golden fruit glaze, vanilla bean and raspberry. Yummy, right? And now I'm offering you the chance to win a Votivo candle of your very own! I've partnered with the fabulous folks over at Candle Luxury to offer three winners the chance to win any Votivo candle from their collection. This prize has a value of $25-$40, depending on the candle selected! All you have to do is enter your name and email address in the box below. The winners will be selected on Sunday, May 9 and notified by email. It's that simple! 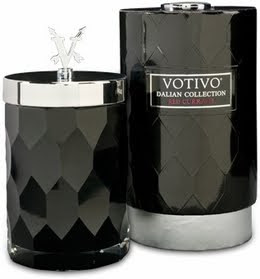 Check out the Votivo collection at Candle Luxury to see all the amazing choices! This giveaway is open to US residents only. Giveaway runs until Saturday, May 8 at midnight. One entry per person, email address and IP address. Multiple entries will be disqualified.